Flowers white with no emergent style-tip; VIII-X; foliage green with yellow tips until the autumn; habit spreading. Artificially created hybrid from Erica tetralix 'Alba' x Erica mackayana 'Shining Light' made in 2005 by J. Baron. The first white-blossomed clone of Praeger's heath known. Named after Bolster, a Dutch term for a bog containing "grey peat". Heliotrope (H12) flowers, VII–IX; dark grey-green foliage; loose spreading habit; height 21–25cm; spread 46–60cm. The history of this clone is not known, despite statements to the contrary; there is absolutely no evidence that it was wild-collected near Clifden, County Galway, Ireland, by J. Mackay in 1846. Re-named Erica x praegeri 'Connemara' in 1969. 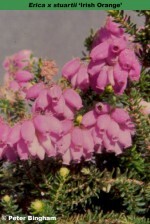 Re-named Erica x stuartii 'Connemara' in 1979. Named after the region in western County Galway, Ireland, where this was allegedly collected. Lilac-pink flowers, VI–IX; dark green foliage, young shoots with orange tips in spring; height 21–25cm; spread 31–45cm. Collected at the same place and time as 'Irish Lemon' by David McClintock. Lilac–pink flowers, VI–IX; dark green foliage, the new shoots in spring tipped pink; compact erect habit; height 21–25cm; spread 31–45cm. Collected near Lough Nacung, County Donegal, Ireland. Registered 26 July 1993: David McLaughlin, Omagh, N. Ireland, UK. Flowers in terminal umbel; VIII-X; corolla white; ovary pale green, cylindrical, with uneven covering (mainly around upper part) of short hairs; anthers pale tan, with prominent awns; nectary ring green; habit bushy, low-growing heather, with pronounced tendency to produce "discoloured" (yellow) branchlets that gradually turn green; retains yellow (dis)colouring into late summer; long cilia (hairs) on margins of leaves and sepals usually not gland-tipped. This is only the second clone of Praeger's heath known to have white flowers (see Heathers 9: 76 (2012); Ericultura 163: 14 (2011)). The origin of this clone is not known. It has been grown in Connemara by Susie and Alan Kay from material given to Susie Kay by Dr John Griffiths, and in Norfolk by Dr E. C. Nelson. ® DME 2018-04 registered on 26 August 2018 by Susie Kay. Large, dark lilac pink (H11) flowers, VI–IX; dark green foliage, young shoots with coral tips in spring; broad, loose but sturdy habit; height 31–45cm; spread 46–60cm. Wild-collected; found at Lough Nacung, County Donegal, Ireland, by David McClintock (Platt, Kent, England) in 1965; introduced by 1973 as Erica x praegeri No. 3 Seedling. Small, tubular flowers, shell-pink (H16) at the base with beetroot (H9) tips, VII–X; grey-green foliage, young shoots with coral tips in spring; height 21–25cm; spread 21–25cm. First collected by Charles Stuart in Connemara in the late 1800s; refound at Craiggamore in 2000 (see Yearbook of The Heather Society 2001: 35–37). synonyms: Erica x stuartii 'Stuartii'; Erica x stuartii 'Charles Stuart' (rejected).